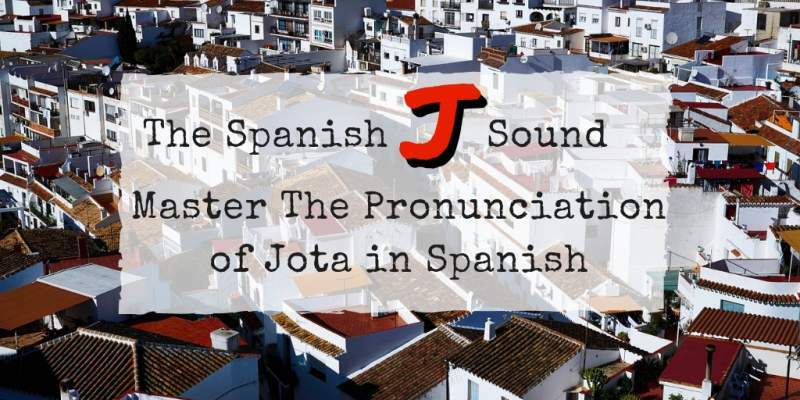 Of all the Spanish pronunciation you've had to master while learning Spanish, you probably haven't given much thought to the “jota” or J. You might be wondering why I've bothered to have an entire blog post and video dedicated to this one, simple letter. Most Spanish textbooks and guides tell learners to pronounce the letter J like the letter H in English. While that's not entirely incorrect advice, it is incomplete. And that's where today's post comes in. 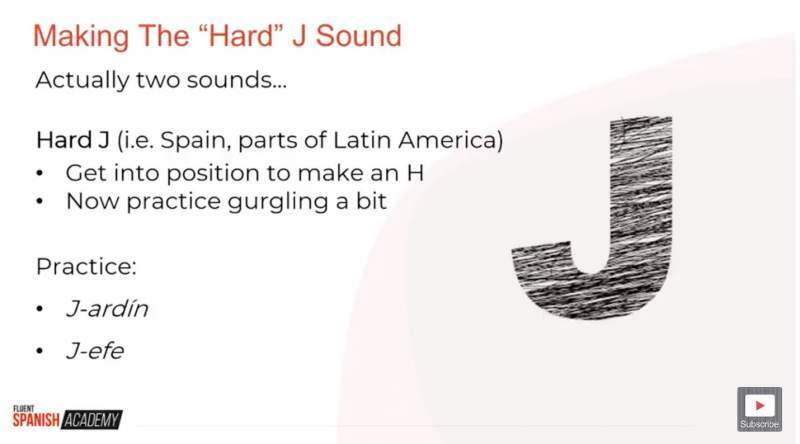 I've included a video all about the Spanish J sound, complete with clear audio examples. Or if you prefer to read, you can also scroll down to read the full article below. Once you've finished with the article and video, you will be ready to confidently pronounce the Spanish J sound when you speak. Have you ever heard someone speak Spanish and wondered what in the world was said, only to see a written description and had it all click into place? This has happened to me with museum tours and menu items at restaurants. What started as a totally confusing situation got so much better once I could see the words written out. The fact is that words in isolation do not have the same sound as when they are used in a sentence. Context, accents, and just the individual cadence of a person's speech all change the way words sound. 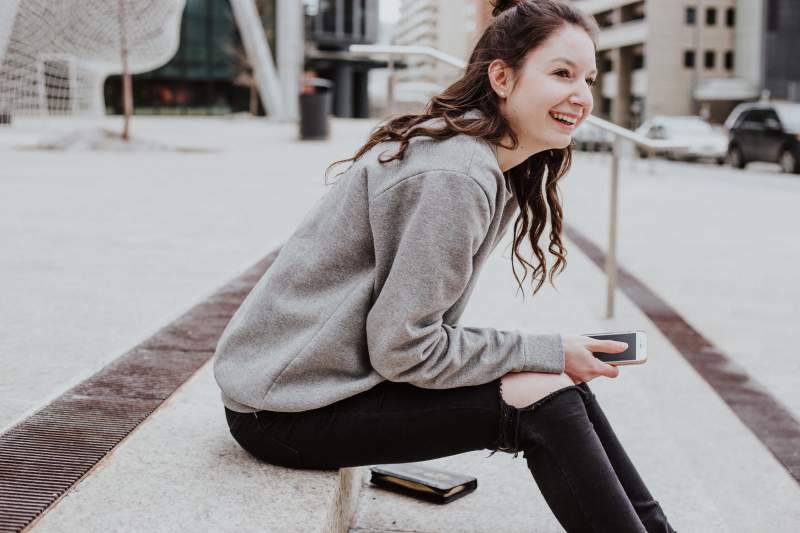 The more accurate and confident you are in your pronunciation, the easier it will be to understand native speakers…and to be understood yourself. The Spanish J is not the most complex sound Spanish learners have to figure out. It's not nearly as tricky for most English speakers as the RR or LL, for example. In reality, however the “jota” (or J) in Spanish makes a unique sound that doesn't really exist in English. You can approximate it with an H sound (such as in “hello” and “hard”). But our goal today is to truly master the jota and sound like a native Spanish speaker, not just come pretty close. 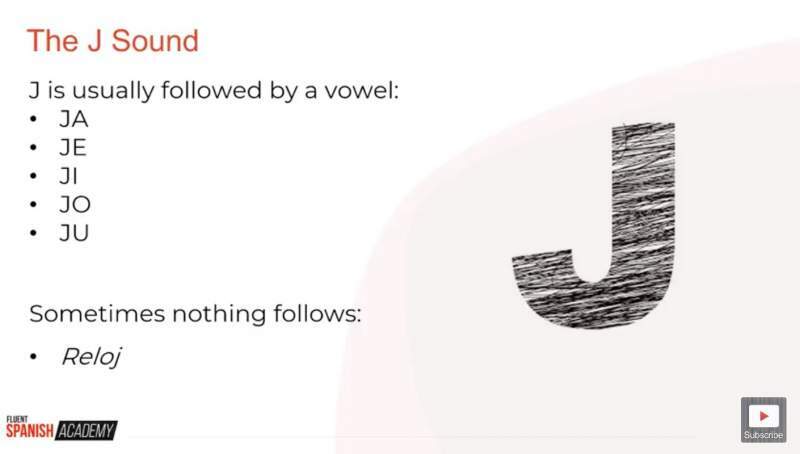 Jota only ever comes before vowels and at the end of words (like reloj), so you can break down the sound into five sounds: JA, JE, JI, JO, and JU. Before we dive into each letter combination, let's look at the different ways J is pronounced in the Spanish-speaking world. There are actually two J sounds in Spanish. In the Caribbean and Central America, the jota has a softer sound. This softer J is much easier for new Spanish learners because it's closer to the H sound in English. It sounds like the H in “hand”, but more in the back of your mouth (and also a bit longer). As a result, jardín ends up sounding more like “Hhhardin”. In Spain and the rest of Latin America, the jota is harder. I always suggest Spanish learners focus on that more noticeable jota first because it is so common and the more difficult sound to master. Once you learn how to say J with the harder sound, it's very easy to soften it up a bit when you want to speak with a different accent. Get in the vocal position you would use to make an H sound in English, as if you were preparing to say the words “hurricane” or “hot”. With your mouth open and in position for H, try making a gurgling sound. You know, that sound you make when you're gargling mouthwash. That's what you want to do with your throat while your mouth and tongue are shaped like they are for H.
Make a rasping sound in your throat like a really obnoxious snore. That raspy gurgle is exactly the sound you're looking for. This is a sound that really comes from the back of your throat. If you put your fingers at the top of your throat (at the base of your neck), your fingers should vibrate when you make the rasping or gurgling sound. Now you're ready to start pronouncing the jota! Now go back to the beginning of the list and say the words again, this time with gusto. Saying each word clearly (really over enunciate here) and loudly will help you get comfortable with the way J sounds in Spanish. The following strategies will be invaluable as you perfect pronunciation of the Spanish J sound…as well as any other tricky letters or words you come across in your study of Spanish. The more you hear native Spanish speakers pronounce jota, the easier it will be for you to understand and replicate. As an added bonus, increasing the amount of authentic Spanish you listen to will also improve your listening comprehension and vocabulary! When you first learn a new sound, really focus on the shapes your mouth makes in order to form the words correctly. You probably aren't used to paying attention to your mouth and tongue when you speak English. But even subtle variations can make a huge difference on how something sounds. Be patient with yourself. You may have to break each word into smaller parts and practice each syllable separately. There is nothing wrong with repeating a recording of a word over and over while you first get used to the sound. Even if you don't have the word or sound down pat, keep speaking! In time, your dedicated pronunciation practice will come through in your conversations. Until then, any pronunciation mistakes you make will be worth the invaluable learning that comes from real-time language practice in authentic conversations. Accurate pronunciation has never been easier thanks to technology. Listen to recordings or videos of how to pronounce a particular letter or word. Record yourself with your smartphone, an online voice recorder, or a handheld recorder. Then listen to your pronunciation and compare it to one of the recordings or videos you used earlier. How does your pronunciation compare? Are you stressing the right syllables? 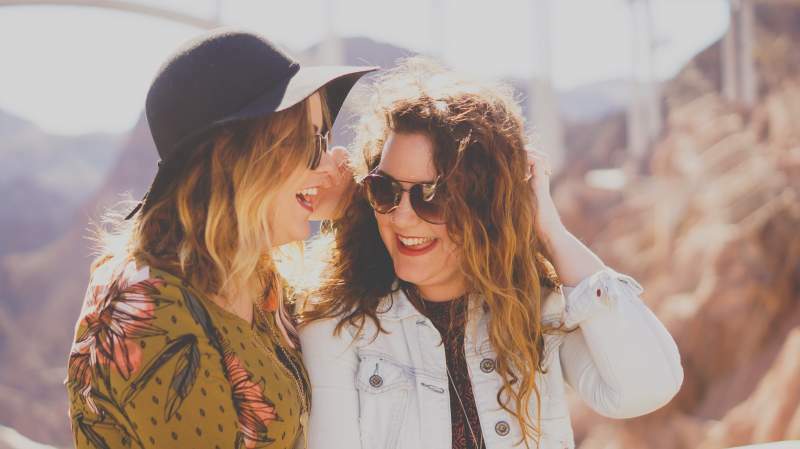 If you're having a hard time figuring out how close your pronunciation comes to your goal, ask a friend to listen to both recordings and let you know where your pronunciation differs. In the end, your mastery will come with practice. That means you should do everything you can to use your new word(s) every day, including in silly ways. Just like I mentioned in the blog post on B/V pronunciation in Spanish, tongue twisters (trabalenguas) are a fantastic way to challenge yourself and practice difficult sounds while still having fun. Start slowly with each trabalengua, focusing on pronouncing each specific word clearly. Overemphasise the pronunciation if you need to in order to really get used to the way the Spanish J feels and sounds. As you feel more control over the silly phrases, you can speak a little faster each time through. By the time you can fly through each trabalengua without missing any words, you'll have a mastery over the jota that will work in your regular conversations as well. It's To Sound Like A Native In Spanish! 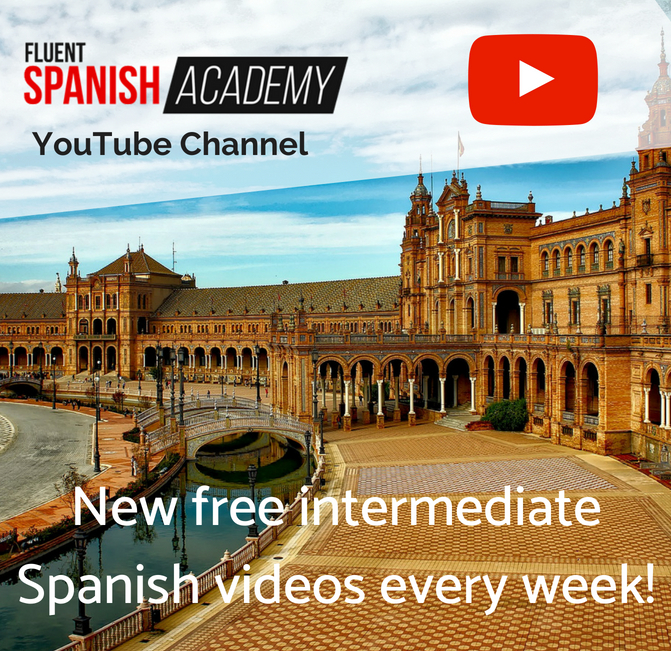 You now have solid strategies for continuing to improve your Spanish pronunciation and specifically how to pronounce the Spanish J sound like a native speaker. As I've already said, pronunciation matters. With a little extra focus on pronunciation, you'll be able to sound more like a native and better understand native Spanish speakers yourself. 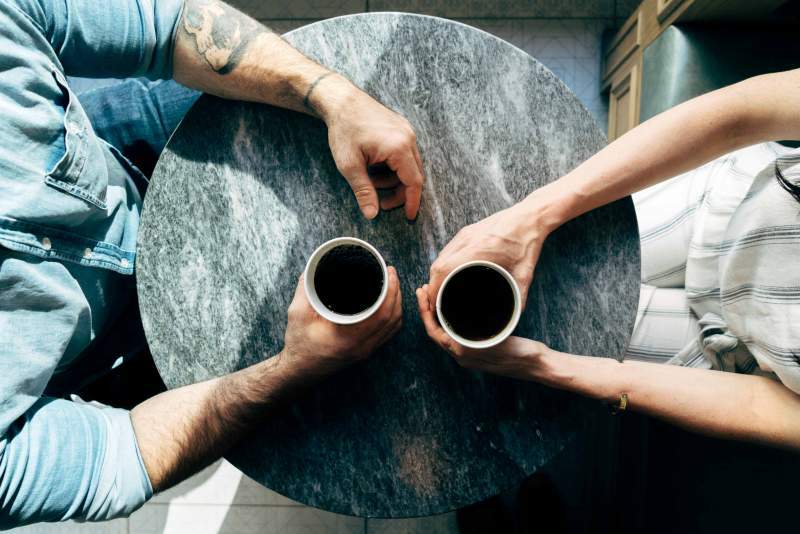 Just imagine the boost that's going to give you in conversation: you'll be easier to understand and your conversation partners will sound a whole lot clearer too. You'll be pronouncing the jota like a native speaker in no time. So go out there and get practising. Do you feel more confident about pronouncing the Spanish J sound now? What other aspects of Spanish pronunciation do you find tricky. Share your thoughts in the comments below.